“Smolder and creep” was the byword Tuesday on the 12,420-acre Howe Ridge fire in Glacier National Park, mild enough behavior to prompt cancellation of evacuation warnings for the town of Apgar, the Grist Road area and the North Fork. The cooler, wetter weather of recent days gave firefighters time to finish a “significant” reinforcement of containment lines on the south side of the fire. 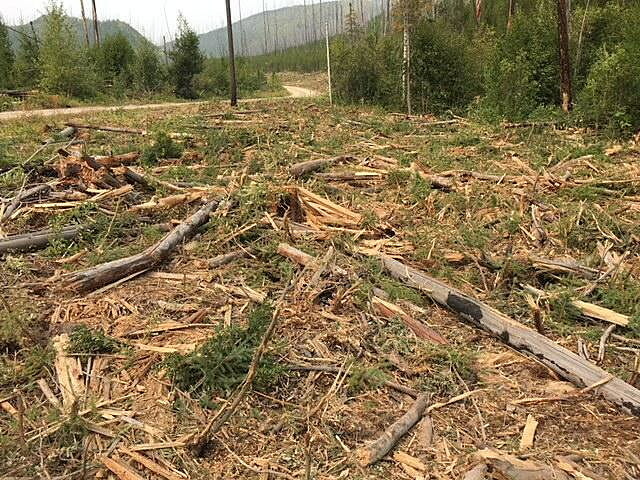 That does not, however, mean Howe Ridge or other wildfires burning in the park and adjacent areas of the Flathead National Forest pose no threat – or that they were extinguished by recent rain and snow. Incident commander John Pierson’s Southwest Area Type 1 Incident Management Team reported that Howe Ridge remains active on its northern end and could intensify with winds and drier weather forecast for Thursday and Friday. Alley said Fish Creek Campground has been closed for the season, as it was originally going to close on Sept. 4 anyway and the logistics of reopening the area are sufficiently complicated to prevent a short-term reopening. The Fish Creek Campground Road remains closed, as does Glacier Park’s iconic Going-to-the-Sun Road from near Apgar to Logan Pass. Alley reported that trails along the Camas Road will reopen, with the exception of trails off McGee Meadow. The Howe Ridge fire continues to move across new territory on its northern edge, according to Pierson’s Tuesday briefing. The fire is within 150 feet of the Sun Road in some places. 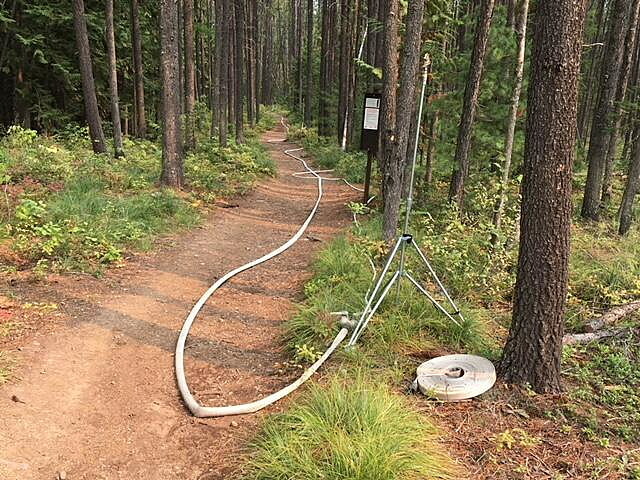 An extensive sprinkler is in place along the Upper McDonald Creek trails as a barrier firefighters hope will contain that section of the fire before it reaches the Sun Road. Firefighters also have placed sprinkler systems at the Upper McDonald Creek stockbridge, throughout the Avalanche developed area, at Red Rocks Overlook and at the Logan Creek patrol cabin – as a fallback if the fire crosses the road. Sprinklers are also wetting down the Trail of the Cedars to protect that historic grove from any advance across the road. A mandatory evacuation order remains in effect between the foot of Lake McDonald and Logan Pass along the Going-to-the-Sun Road. Lake McDonald Lodge has been closed for the season. At the recommendation of the incident management team, the park on Tuesday also lifted the evacuation warning for the area north of the Bowman Lake Road junction with the Inside North Fork Road. Meanwhile,in the remote northern reaches of Glacier Park, the 2,125-acre Boundary fire also slowed its pace with the arrival of cool, wet weather. On Tuesday, Pierson’s Type 1 team intended to install equipment to allow radio communications in the area which in on the U.S.-Canadian border. A warming trend is in the forecast, and with it the likelihood that the fire will spread, so Pierson’s staff was using the cooler days to develop a plan of future action. Goat Haunt Ranger Station, boat dock and more than a dozen associated buildings have been protected – should the fire make a move on Upper Waterton Lake. In her announcement, Alley said all trails originating at Goat Haunt are closed. Boat tours operated by Waterton Shoreline Cruise Co. out of the Waterton townsite are once again landing at Goat Haunt. Visitors will be limited to the boat dock pavilion and restroom area. Glacier National Park and most of western Montana are under Stage 2 Fire Restrictions. That means: No campfires are permitted in Glacier’s front country or backcountry. Smoking is also prohibited except within an enclosed building, vehicle, developed recreation area, or barren area three feet in diameter. Propane stoves that have an on/off switch are permitted.